Team NL Running & CrossFit gear is almost ready as well. This year's changes are subtle from years past. Throughout out our gear, we've returned to our original Love Your Neighbor graphic in an effort to gain more continuity between all NL branding. The biggest change you'll notice is the back design. 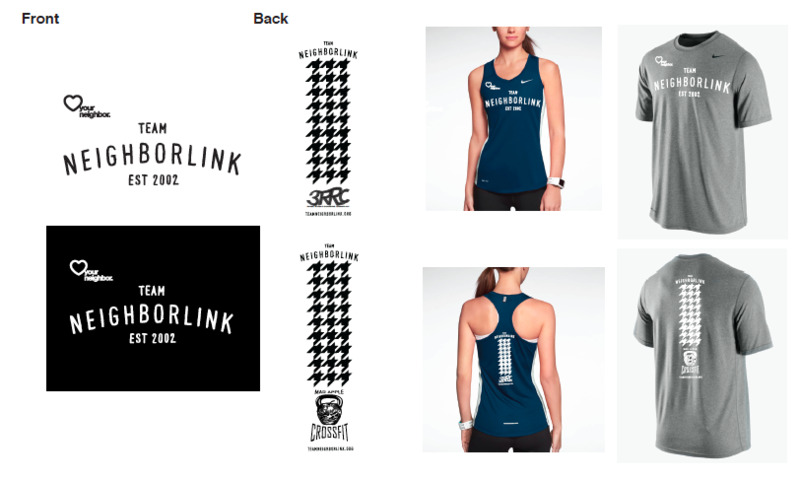 We've brought the houndstooth from our cycling kits to the running shirts, and landed on the far design with the small Team NL logo above the houndstooth. We're also simplifying the sponsor logos and only having one logo for CrossFit specific shirts and one for Running specific shirts. We've done so to give more priority to the sponsor that supports our team in that way and to reduce the "free event shirt" feel that all the logos on there have. We'll do some simple t-shirts that have all our logos on them to provide team members with a way to support all our sponsors. Everyone seemed to love the shirts we chose last year, so we'll likely keep those options for 2015. The TASC, Adidas, Mazuno, and the Nike shirts were all a hit. If you have any other ideas or would like to provide your own gear, please do so. We will be gladly print anything you want as long as you get it to us prior to going to print.